Bosch is demonstrating a cloud-based wrong-way driver alert system that uses few thousand lines of software code can protect human lives form danger of encountering a wrong-way driver on freeways. This lifesaving cloud service not only alerts the driver who is heading in the wrong direction; it also warns other motorists in the danger zone, sending out push notifications in 13 European countries. Initially integrated into the radio apps of the German broadcasters, the wrong-way driver alert already has 400,000 unique users and is primed for more. Some 15 navigation, streaming, and radio apps now feature the app function developed by the company. 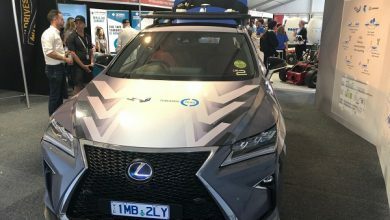 To detect whether a car is joining the freeway in the wrong direction, the cloud-based function compares the vehicle’s actual movements with the permitted direction of travel. Information about this is stored in a database. The driver simply has to have the app open in the background for this to work. Any driver who mistakes an off ramp for an on ramp is alerted by push notification. At the same time, oncoming cars in the vicinity are alerted to the danger. The more connected vehicles there are, the closer-knit the invisible safety net will become. This, in turn, will enhance the effectiveness of wrong-way driver warnings. 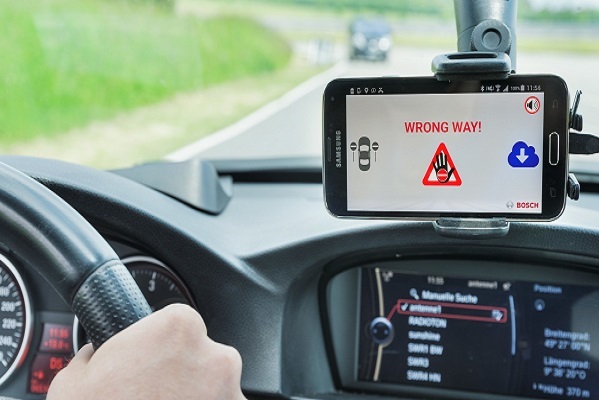 The company will use a new software module to integrate the wrong-way driver alert system directly into future vehicles’ infotainment systems. The dash display will then give the driver a heads-up within just a few seconds. Bosch is talking to many automakers who want to offer the wrong-way driver alert as a standard feature.